The Associated Press released a hot story this week, claiming that 1 in 10 US high schools is a "dropout factory." State data shows Midway High has an 80% retention rate, not 56% as the AP claims. And the state says Rockwood High has a 75% retention rate while the AP claims the rate is 59%. I would add that the state’s figures are often misleading as well — and not in the schools’ favor. The "graduation rate" measures those students who graduate in four years plus a summer, but does not include those who receive a special education diploma, who take an extra semester to graduate (for any reason, including illness or serious injury), who get a GED, etc. The "dropout rate" is a different number — not the difference between graduation rate and 100%. Even so, some students are miscategorized as dropouts, when they aren’t. To honestly address the problem, we must first honestly accept what the problem is, and what it is not. To be constantly fighting a public relations battle simply takes time and focus away from the real issues. Today, Judge Blackwood issued a ruling the motion for summary judgment by Layton and the Anderson County Election Commission, as was heard on Monday. The judge denied their motion, which means that they must respond to Stuart’s interrogatories by Nov. 2, and produce the requested records by Nov. 8, in advance of an evidentiary hearing on Dec. 13-14. It’s a victory for Stuart that should have come more than a year ago, IMHO, and a victory for the voters. I’ll accept a legitimate result even when it doesn’t go my way, but there were real problems in this (August 2006) election. I should be Christmas shopping on Dec. 13-14, but this is a show that I’ll want a seat for. 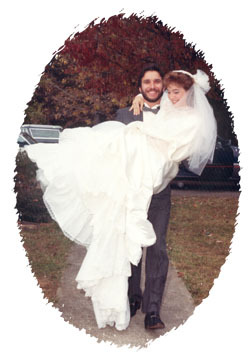 Twenty years ago today, we each said "I do," and we meant it. Like most people, I suppose, we really had no idea what the future held, except that we would face it together. Even at 23, I was quite serious about that; when he proposed to me a few months earlier, I asked him if he was quite sure, because I would kill him before I would divorce him. He accepted those terms. So I agreed to love, honor, and cherish — though not necessarily to obey — forever. What neither of us expected, though, was to find that we are closer, enjoying each other’s company even more, after two decades. With the kids out of school on Fall Break and my parents (our reliable overnight keepers of the teens) out of town, we can’t really go anywhere, but we’ll go somewhere for dinner tonight. Maybe we’ll get wild and go dancing, the way we used to. Maybe we’ll just find a nice dinner somewhere, laugh about surprisingly ordinary things, and appreciate that we found each other. Laughter is a big part of what works so well — we’re just enough alike, but just enough different, to find humor in something every day. It doesn’t really matter what we do, we usually have fun if we’re together. 9 comments Wednesday 24 Oct 2007 | Netmom | Etc. Talking way too fast for me to accurately transcribe, self-described education evangelist Ian Jukes lectures to the final session of the NSBA T+L conference this morning in Nashville. His message is simple, yet almost indescribably complex: today’s students — everyone 25 and younger — are simply, physically and intellectually different. It’s rather widely known that various experiences alter the development of neural pathways in the developing brains in children. The digital bombardment of interactive experience with games and computers. The new field of neuroinformatics studies the ways that specific mental processes occur. In short, they’re finding that today’s students, whom he calls "digital natives," are using measurably different neural pathways to process the same tasks as those who are older. I rather wish that Joel was here to give me some hints about the validity of this research. One of my questions would be, will these same digital natives process information the same when they’re 40 as they do at 16 (when they’re less hormonally handicapped). One of the findings is that today’s students’ attention is much more strongly drawn to the upper left half of a page, with attention to the lower right half — think about that, and think about the context of a typical web page: where are the menus? Should the producers of educational materials take that into account? Digital kids think differently, process information differently, than we do. Our teaching and assessment methods, he says, is completely out of sync with they way they learn. Unlike us, they can process multiple forms of information simultaneously. It is time for education and educators to catch up, to learn the new digital world. In the information age, students need to be both producers and consumers of content. We have to move beyond 20th century literacy to 21st century fluency — being able to use technological tools without thinking about it. "Focus on headware, not hardware." Educators need to shift their instructional approach from director to facilitator, encouraging higher-order thinking skills. After two weeks, students remember 10% of what is read, but 50% of what is seen and heard (simultaneously), and 90% of what they both say and do. He thoerizes that rather than experiencing an epidemic of ADD and ADHD, we’re simply not teaching effectively to the way students learn today. If we want understanding and comprehension, we must teach in a new way. We need to let students access information natively. Just as calculators were scoffed in the 1960s, social networking is similarly cast aside in schools today — where it needs to be an integral part of learning. Prepare them for their future, not our past. A decade and more ago, there was a cute little boy in our neighborhood who spent many an afternoon at our house with Alpha — jumping on the trampoline, tossing a football in the front yard, even having a pie-eating contest once in the front yard. Those were the salad days of childhood, when happiness was a batch of warm cookies and a cold glass of milk. One afternoon when Hubby was splitting firewood in the yard, this boy and one other watched, fascinated, convinced that they, too, could split a section of Oak with a single crack. Hubby couldn’t resist letting them try… but needless to say, they were unprepared for the weight of the axe or the stubbornness of wood. Nary a dent was made. The two watched in awe as Hubby continued making big logs into small ones, then took up catching fireflies instead. Those were the salad days… the innocence of childhood. As a young teen though, the boy moved out of his aunt and uncle’s house on our street, presumably back with his mother in some other part of town. Through middle school, he and Alpha grew apart — about the usual age when kids begin to define their friendships based upon mutual interests rather than geography. As high school approached, I began to hear murmurings that he was getting into trouble. By the time he was 18, it wasn’t murmurings anymore — it was his name listed in the paper under police reports. Today, at 20, he’s front-page news: accused of attempted murder. What went so wrong in the space of 10 years? What on earth could cause the young man — who, as a youngster was kind and polite — to steal without remorse, then later, to brutally, horribly, stab and bludgeon a former classmate, leaving him for dead in an alley? By all accounts, Jon Grider is a nice young man. He did not deserve the fate bestowed upon him early Tuesday morning. My heart aches for him, and for his family, that he had to endure such a horrific night. One lies in the hospital, fighting for his life. The other, while healthy, is looking at a life that is functionally over — a future of hard prison time, and little else. In Nashville this year, fully 20% of the murders were committed by children 17 and under (all but one of those were shootings). There’s no argument for leniency on my part, but yes, I do admit to sadness that it happened at all. What is it that turns an adorable child into a cold-blooded killer, within just a few short years? 3 comments Wednesday 17 Oct 2007 | Netmom | Etc. This morning, Judge Blackwood again began hearing motions in the election contest between plaintiff David Stuart and defendants Don Layton and the Election Commission, after the Court of Appeals found the lower court in error and the State Supreme Court declined to hear the defendants’ appeal. Thus, we’re back sort of where we started, a little more than a year ago. That voters were not required to provide identification in two precincts. In an election where the margin of victory was only 119 votes countywide, it’s entirely plausible that these errors may have made the difference in the outcome. Stuart simply asks for a do-over, and asks that it be held in conjunction with the already-scheduled countywide election on Feb. 5, 2008 (so as to make the cost to the county negligible). Stuart has issued several interrogatories to the Election Commission’s attorney, to which the defendant has responded "neither affirm nor deny." In plan language, that means he’s asked some questions and the Election Commission’s reply was "we don’t know, and we haven’t even tried to find out." Today, Blackwood set deadlines of Nov. 2 for the questions to be answered, and Nov. 8 for the requested records (the names of poll workers at two precincts where no identification was required of voters, I think) to be supplied to Stuart. A trial date has been set for December 13-14. It will be interesting to see this unfold in December. WATE has the story about a fight on a Knox County school bus, but unlike most, where witnesses may or may not talk, this one was caught on tape (by another student). It’s patently obvious that the victim did not fight back, yet he, too, is out of school until a disciplinary hearing can be held. The fight happened October 5 on the way home from school. It was filmed by another student who wasn’t involved in the fight. And it was posted on the site my.break.com. It’s not known what lead up to the fight. But the video shows a 14-year-old boy named Aaron standing up on the bus saying he doesn’t want to fight . Aaron is heard saying, "I’m not getting in a fight. I’m not going to fight," several times. He says "Let me through! Let me through!" But as Aaron tries to make his way down the aisle, another student blocks his way, pushes him and starts punching him. Once Aaron falls to the floor of the school bus, the other student is seen kicking and stomping on him until the bus driver pulls him off. Amazingly Aaron wasn’t seriously hurt. But his mother, Kimberly Carlisle, is outraged. As she has every right to be. When a student is jumped by one or more others seeking a fight, it’s my opinion that the victim should not be punished — even if he or she attempts to defend against the attack. (By defend, I do not mean revenge, but a shove to create the opportunity to get away should be acceptable). In this instance, there’s a tape (it’s short — go ahead and see for yourself) that shows unquestionably that the victim did nothing wrong. No defense at all. Yet, he’s falling behind in his classes (right at the end of the term, even) because the school system can’t seem to see what’s right there for the whole world to judge. The victim in this case is doubly harmed: once by the beating, and again by putting his academic success at risk. It should never happen that way. Anderson County Commissioner David Bolling has resumed blogging, with timely posts on a couple of issues that people have been talking about for weeks (or longer): the county’s payment to an insurance broker (who is also a close friend and political contributor to the County Mayor), as well as full disclosure on the issue of moving the Juvenile Court — specifically, discussion about whether to move the Juvenile Court to the Jolley Building, or to move the Clerk and Trustee’s offices across the street and put the Juvenile Court upstairs. **As a disclaimer, I know that the more I talk about this the more I will be accused of petty politics because I may or may not consider running for County Mayor in 2010. To that, I would say that for the next three years at least, I have the responsibility of being a County Commissioner, and the obligation to do what is right by the people who elected me. I hope that doesn’t ever come across as petty. David is a good guy — no, better than a good guy: he’s the kind of person I would respect and trust as my County Mayor. When City Council appointed a Charter Review Committee in July, I had some concerns based simply on the makeup of the committee. It’s not that Council chose poorly, but the pool of applicants was rather limited — not at all the kinds of community leaders who had run for and served on the Charter Commission a couple of years ago. The Charter Commission implemented the charter review committee, to eliminate the months of effort required of them to update and bring the Charter into compliance with state law. Their intent, clearly stated, was that the charter review committee would not undertake major policy revisions, but simply a periodic housekeeping function. Early on — perhaps at the very first meeting — some on the committee began talking about major renovations rather than housekeeping. Fortunately, they were redirected to their mission. Now, however, these issues have surfaced yet again. Oak Ridge resident Virginia Jones has asked a city committee to consider recommending that City Council members be elected from districts. The city’s seven Council members are currently elected to citywide at-large seats. To his credit, Chairman Tom Normand said that the committee will remain focused on their primary mission of updating the charter before any other issues are discussed. However, I am disappointed that the option to consider revisions outside the scope of the committee’s purpose may be considered later, when the housekeeping is finished. I’m further disappointed in other committee members who indicated an interest in "keeping it on the table." District representation in a city the size of Oak Ridge is a bad idea for two reasons: one, it artificially limits the talent pool available to the citizens for choosing those who will represent them on City Council and the School Board, and two, that it introduces a much greater potential for bargaining — things like "I’ll vote for an expensive neighborhood revitalization in your district, but only if you vote for an equally expensive new greenway in mine." Pork-barrel spending, made intensely local. With the School Board, the problems could be similar. We are extremely fortunate (and unusual) to have a school system where resources are allocated based upon need, not greed, and in a balanced fashion. I would like for it to stay that way — we all should, as it is for the overall health and well-being of our city. Charter Review Committee: please stick to your designated mission. If you want to make major policy changes, run for the Charter Commission next time so that the voters will have an opportunity to select you (or NOT) based upon your positions. All in one day: Lincoln Davis says he’s running for Governor (in 2010), and Harold Ford Jr. announces that he’s chosen a bride. Despite rumors that have circulated for months, he chose today for what reason? Couldn’t be speculation over the last few years about his preferences, could it? The irony of the timing is a hoot.